I love to cook. I don't think that will come as a surprise to anyone. What I don't love is trying to figure out what I want for dinner while driving home from work, then going to the grocery store, finally getting home and cooking. Nope, that's no good (have you been around me when I'm hungry?? enough said). So I have been trying to meal plan for the week, do my grocery shopping on the weekend and then I'm ready. I decided to share this with y'all because maybe someone else has the same problem that I have-- always asking "what's for dinner?". A few things to note... Hopefully this will be a somewhat weekly post. I'll try to keep the archives organized, so you (and me!) can look back through them if you need some ideas. 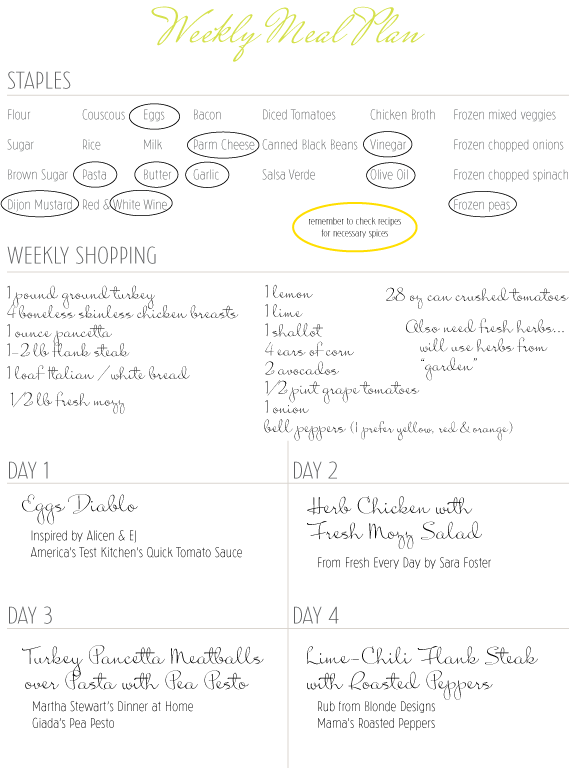 I'll post all of my weekly meal plans in this Picasa album. 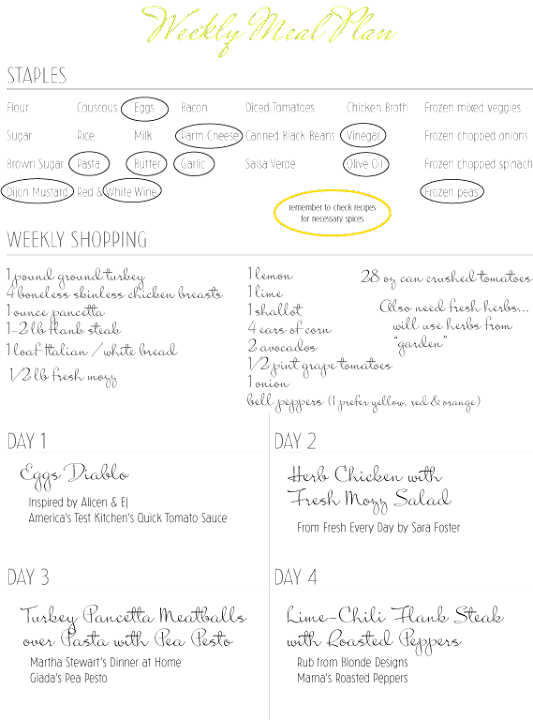 I'll include the list that I publish on the blog and a copy where the shopping list areas are blank. I'll also post the recipes and will link to those on the Recipes Page. Still trying to figure out the best way to do this, so for a while it will be a work in process. Also, you'll note that I have 4 days of meals planned... that is what works for Andy and me. The other three nights we either have separate plans or go out. Each meal is supposed to feed 4 (so the recipe says... I'll note accordingly in the recipes if I feel differently). That means that we have leftovers for another night or for lunch. You'll notice that I've organized the meal plan into staples and weekly shopping. Circled items are what's needed for that week. Fairly self-explanatory, right? And sometimes, I'll post recipes that are made just from staples for those nights when I'm running behind, tired or just don't really want to cook. My plan of attack would be to shop on the weekend (usually Sunday for me). Marinate the chicken and the flank steak. Definitely pop the flank steak in the freezer and, depending on when I plan to cook it, maybe the chicken as well. If I have some extra time, I would try to make the tomato sauce, but it's not necessary as it can easily be done after work. Everything else should be doable after work. My goal is to have healthy, home cooked meals most nights of the week. Hopefully I'll get into a rhythm with this and someone else out there will also enjoy it (let me know if you do! ).